This project started four years ago. What started out as a three-part article has turned into four. Less problems and it would be just three parts. During that time, airplanes were built, crashed, and rebuilt. Prop molds were made and destroyed. Props were made and tested. The Computer Controlled Foam Cutter sits in the corner waiting for me to get the courage to complete it. It is time to finish the project and start cutting foam. I was watching a TED conference and was amused by a talk by Tim Harford and ordered his book Adapt Why Success Always Starts with Failure. This is now my motto on all my projects. The last step is to wire the stepper motors to the control box, assemble all the pieces together, and power up. 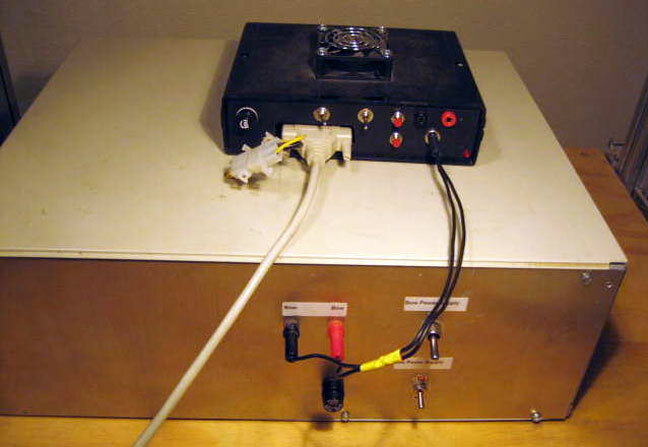 In Part I, the building and testing of power supplies was discussed. Before powering up, you have to load the software to control system. This is available online and can be used for 30 days before you have to purchase a license. It took me a couple of days before I got the nerve to energize the system. In reading the post on the various group forums, I could envision a major melt down. With a fire extinguisher by my side, I threw the switch. No smoke, no melted plastic, and most of all I did not start to glow. I spent a month becoming acquainted with the Gilles (GMFC) software. At the end of the month, I ordered it. Gilles has tutorials, but I could not download them using Microsoft Internet Explorer. There was a problem with Gilles' ISP and Microsoft. After contacting him, he was able to correct the problem. I decided the first project would be the R&B Rip-off wing. Each panel is 24 inches, and the airfoil can be used for F2D or Fast. To get this into the program required taking the airfoil and converting it into a CAD drawing. Time to learn AutoCAD. After a week, I had the airfoils drawn in AutoCAD. The CNC software requires the AutoCAD file be saved as a DXF file. I loaded the root airfoil into the software and there on my screen was an airfoil. Well not really. What I had was an airfoil that looked like I had given an airfoil drawing to a four-year-old kid and a red and green Crayola and told them to color the airfoil. The red and green shows the cut path the wire follows. Off to the web help site, where I learned that what I thought was a beautiful airfoil had some issues. When you create an airfoil in CAD, you have to turn it into a polyline. Since you build the airfoil in segments, what looks to be a joined line between two segments may not be joined. When this is entered into Gilles' software, it sees this as a change in the cut path - the Crayola effect. The way to solve this is to go back into the original drawing and zoom into each area where the cut path changed. When you do this, you will see the lines are not connected. If you used points to create the airfoil, you may have duplicate points; again, contributing to the Crayola affect. In an effort to get foam cutting going, I used my old method of cutting foam blanks. This meant a straight leading edge and a tapered trailing edge. Once I got into working with the software, I realized that there is a lead in before the wire begins the airfoil cut. 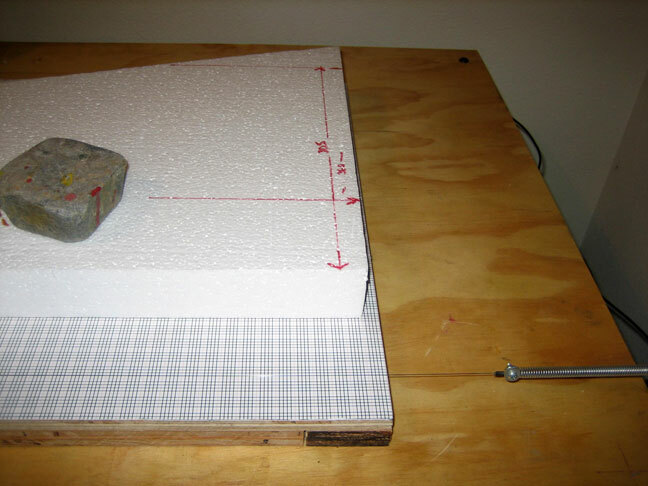 Since I use female templates when I manually cut, I was thinking that this is how the CNC foam cutter would cut -- not. 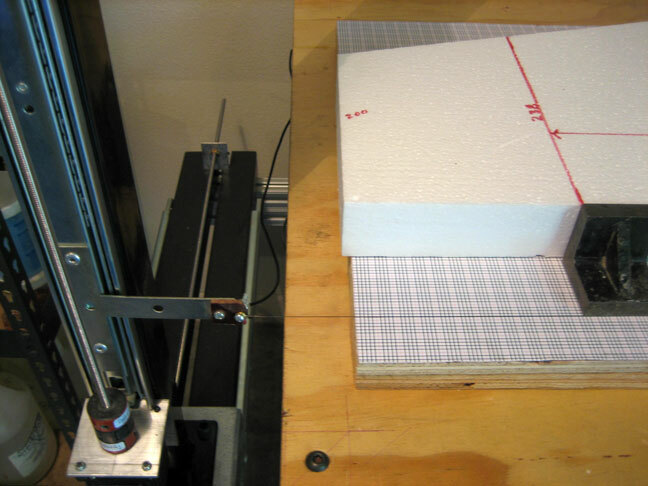 The machine vertical (Y) axis did not have enough movement. To solve the problem I took the table completely apart and lowered the cutting surface. I also changed the first project that I would cut. I created airfoils for a 1/2-A. This would work for the foam blanks that I had prepared. When I prepared the 1/2-A airfoils, once again the Crayola effect was there. This time I knew how to correct it. Typically, it takes me about eight hours to convert a wing into a workable airfoil. This includes manually developing the XY points from a drawing and then putting them into CAD and the cleaning up to get where it is correct for the cutting software. Here you see a typical screen shot. Before putting in a piece of foam, I ran the system with no heat to the wire and watched the movement. 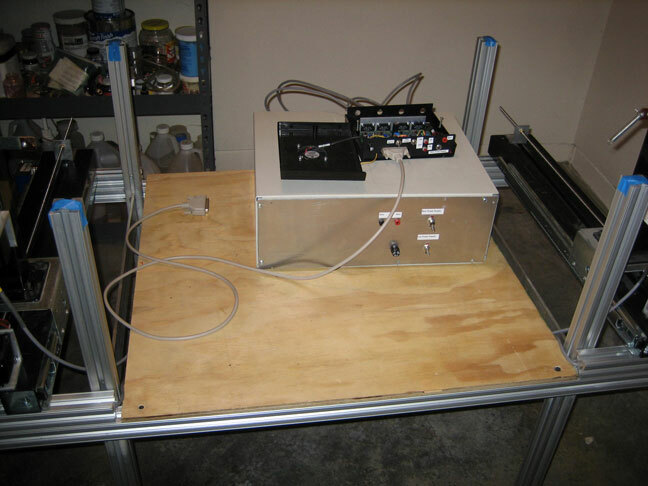 During this test, I discovered that I needed to make some minor adjustments to the mechanical side of the system. With these completed, I decided to cut a wing panel. From the Internet post, there was mention of lots of wasted foam. Initially I put in what I thought were good values, and proceeded to cut a wing. Thinking that I had saved my settings I went straight to cutting a wing. In the panel cut screen, you see the airfoil and you see the cut line. I noticed something funny looking at the leading edge and thought that it was just a graphics issue, but to be sure, I would cut and see what happened. All the setup work that I had done was for a left panel cut. The default is for a right panel and I did not catch this. Once the cut started, I realized the mistake, since the wire was not moving as I thought it should move. Secondly, I realized what the leading edge problem was. The Kerf that I set was not correct and the heat setting was too high. I was melting foam. 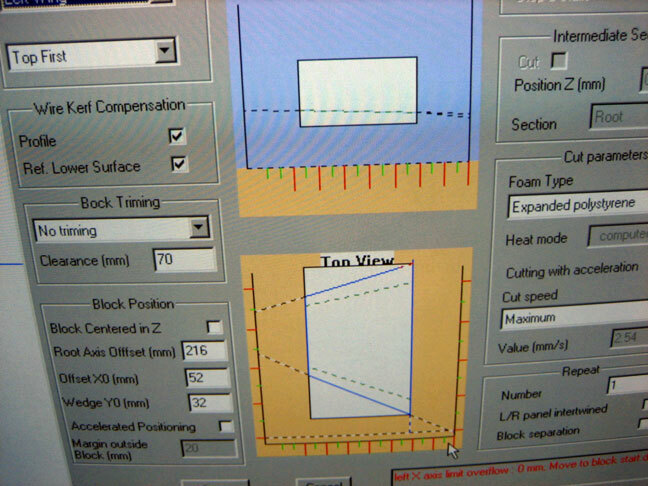 The software instructions, give a procedure to follow for setting heat values and measuring the Kerf. You can use a full span of foam or blocks at the root and tip. I used blocks at either end. The default heat setting is 70%. When I set the parameters to do a test cut, I received an error message. The software documentation did not give any indication as to how to solve the problem. One of the inputs you have to make is to set the values for the foam type you are using. What I discovered is that the cut speed must match the speed as set in Foam Type. Once this was done, the error message went away and I was able to test cut. I knew 70% was too hot and started with a setting of 60%. Still way to hot for the expanded bead styrofoam. I dropped the heat to 40% and the cut was looking better but still too hot. What I wanted was a finish just above angle hair. A quick plot of the Kerf versus Percent showed a linear relationship. I dropped to 25% and got good results. The next issue was getting the Panel Cut set correctly. As I have been going through the debug stage, it has taken a lot of patience to understand how the different programs relate to each other and what has to be adjusted. While learning the software and running the machine, the front to back (X) axis stopped working. Before looking for the problem, I went onto the support group site and tried to search for key words that would give me a starting point. At the same time Yahoo decided to make some changes and the site would not let me search for key words. After about a week, the Yahoo site came back up, and the search said that the problem was most likely a cold solder joint on the circuit board, and to reflow the solder. I was skeptical that this would solve the problem since I had done a good job soldering; however, I reflowed it anyway. I put everything back together and powered up. I was correct the problem was still there. I suspected the terminal block where the stepper motor is connected to the board might be a problem. I ordered two new chips and one new terminal block. I got an email from Dave saying he only had one chip and they were discontinued. I was able to find the discontinued chip on other websites if I wanted 50 of them. Dave sent the chip and terminal block at no charge. Having done a good job on soldering I was now faced with desoldering the chip and the terminal block. A trip to the Shack, (while this project has been moving along Radio Shack decided to change their name to the Shack, they should have called it Phone) and I have solder braid and a desolder pump. Desoldering was difficult but I was able to get the chip (18 pins) and the terminal block desoldered. I went back to the web site and searched for what might have caused the problem. In one of the post, it talked about how you can damage the block when you tighten the screws but not know it. This in turn will cause a faulty connection and blow the chip. I had suspected this might have been the problem. As I was desoldering I noticed my new high tech soldering iron was acting up but settled down. I soldered the new terminal block into the board and was getting ready to solder the new chip into place when the solder iron went haywire. A call to the manufacturer and they said send it back and they would repair it at no cost. The dilemma that I now faced was if the chip blows, then the machine is dead. Even if it does not blow, then in the future there is no support for the board. Since the original board was purchased and built, there have been improvements that I would like to have. For $109 I could get a new board. What the heck, I ordered the new board. When I opened up the new board, I realized that I needed additional materials. The first system I bought was a complete kit that included motors. I contacted the supplier who informed me that they no longer sold the fans and heat sinks. I headed off to the Internet to find the rest of the parts. Fortunately I had part numbers, unfortunately some of these were no longer available. This left me looking for substitutes that will work. Mouser Electronics had the case, fuse holder, and grommets. Shack had the connectors. I purchased a piece of aluminum and made a heat sink. I took all the components and checked them with a VOM and then sorted them into envelopes by step. The step by step instructions are very good. After eight hours all of the components were soldered into the board. It took another five hours to prepare the case and solder the components to the switches and connectors. The old board has been reconnected to the power supply and it is time to test to see if the repair was successful. I turned on the power supply and the X-axis was not activated. Knowing my limited abilities with electronics I assumed that I must not have repaired the board correctly. After all, the support group said that the most likely cause was a blown chip and I had replaced the chip and the connector. Just for grins I decided to reverse the X and Y axis to see if indeed the repair that I had made did not work. To my surprise, the Y-axis being fed from the X was active. The X-axis being fed from the Y was not activated. It is not the board, but the motor. I contacted the supplier who informed me they no longer carry the motor, but they have a different one. My concern is that to replace the motor will require modifying the mounting brackets. I got a drawing of the new motor and headed off to the shop to check it. After figuring out where the eight wires on the motor went to the six wire connector wire, I hooked it to the repaired board and turned the system on. The new motor did not energize. I grabbed the VOM and started checking continuity between the motor and the wire connector block. The last wire that I checked showed an open circuit. I replaced the six wire connector with a new wire and the problem was solved. I put the old motor back together and installed it in the system and all is fixed. Well not exactly. 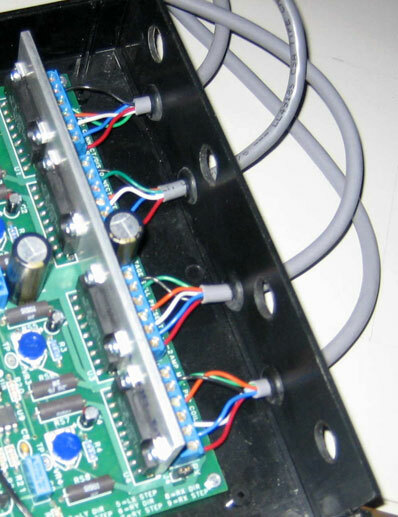 The hardware and software has a heat control for the wire. Something occurred during the rework process that caused the heat control for the wire to stop working. After replacing parts it still did not work. The work around is to use my old bow power supply and connect direct to the cutting wire. With a little testing I got the heat adjusted and started to cut my first panel. On April 26, 2011 I got two panels. I continued to cut and cut 20 more panels: these became the Sonic Chickens.